You have an application that is deployed to an Azure Web App running in Basic App Service hosting plan. You have a couple of web jobs there that are supposed to run on schedule and you chose to define the schedules with cron expressions. One day you noticed that these schedules never fired even though you remembered how you tested them on the Free plan and they seemed to work. You have Always On enabled as you want Kudu to always run to be able to trigger your scheduled jobs. "schedule": "0 0 2 * * *"
[10/12/2015 06:18:27 > bfef75: SYS INFO] 'Basic' tier website doesn`t support scheduled WebJob. [10/20/2015 05:10:10 > 2613fc: SYS INFO] 'Basic' tier website doesn`t support scheduled WebJob. [10/20/2015 14:50:35 > 2613fc: SYS INFO] 'Basic' tier website doesn`t support scheduled WebJob. [10/21/2015 02:32:37 > 882beb: SYS INFO] 'Basic' tier website doesn`t support scheduled WebJob. It has to be some marketing trick! Technically all you need is Always On which is supported on Basic and Standard tiers as you run a dedicated resource (read VM, well at least a separate application pool) and it's possible to configure the start mode of your application pool to AlwaysRunning. Now why did it work on the Free tier? Perhaps they wanted to give you a taste of it or enable you to use the Free plan for development and testing activities and then you were supposed move to Standard for the show time. But why can't you use a perfectly valid Basic plan option when your application isn't that big and you can save a few bucks? You have to authenticate when making requests to Kudu. When you run them in the browser it will send your cookie but you can also use Basic authentication to run them from anywhere else. 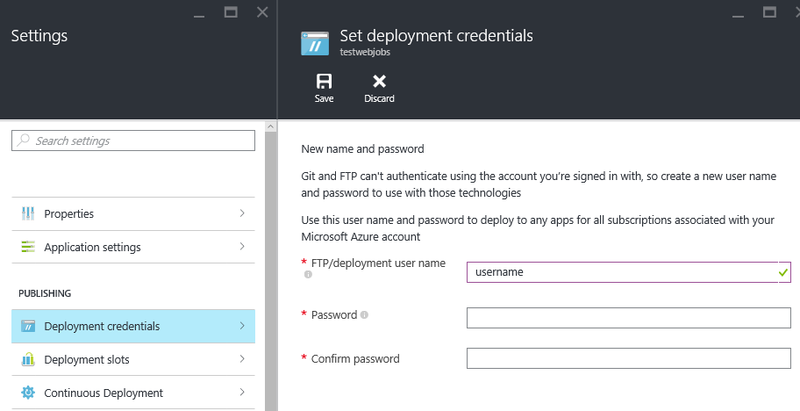 You need to use your deployment credentials which are associated with your live account. Now this is another twisted thing, please see this article for the explanation. The twisted part is that you define or reset your deployment credentials on one of your web app's settings blade but it's going to work with all apps as it's an account-wide setting. You are now ready to set up an external trigger preferably with an automation option that is supported by your chosen scheduling system. You can use external solutions or you can choose Azure Scheduler. One important thing to note about Azure Scheduler is that there can be only one free collection per Azure subscription that can contain up to 5 jobs. Pretty limiting but still can be used for your smaller applications. Another thing to note is that although Azure Scheduler supports a whole bunch of outbound authentication options for your jobs they are not supported on the Free tier. But how does it work when deploying from VS? New-AzureSchedulerJobCollection -JobCollectionName "TestCollection" -Location "West Europe" -Plan "Free"
It's going to create a job in a free collection that will run once a day.